Full-time RVers and weekend warriors alike know that some areas of the country are more expensive than others. Food, gas, campground, and entertainment fees all vary widely from state to state and region to region. We try our best to keep the budget balanced by hitting up both the cheaper places to RV (New Mexico has an amazing deal on state parks) and the more expensive (ahhem…I’m talking about you Colorado). Recently we spent two months in the Florida Keys where things are a bit on the pricey side. A blog reader asked us on Facebook for some tips on how to RV in the Keys without breaking the bank. Well Kevin, we’re doing you one better with an entire blog post filled with Money Saving Tips For The Florida Keys. We had the advantage of a private driveway to park in which saved us a considerable amount of money. But we wanted to camp near the water so we mixed things up by spending a few weeks at some of the wonderful Florida State Parks where the nightly fee is $38 + tax. After eight weeks in the Keys (30 nights free + 36 nights paid) our camping fees were 9.2% higher than average. Like many popular tourist destinations, the campgrounds in the Keys are much more expensive during the busy season (~ December – April). While the summer months – when the temps climb into the 90s and the humidity is up around a thousand percent – are probably not the ideal time to visit, early spring and late fall can be quite nice in the Keys. And you can expect to save big bucks by visiting during non-peak times. With the average per night prices for private parks running over $100 (during the winter months), the state parks are by far the best deal going in the Keys. 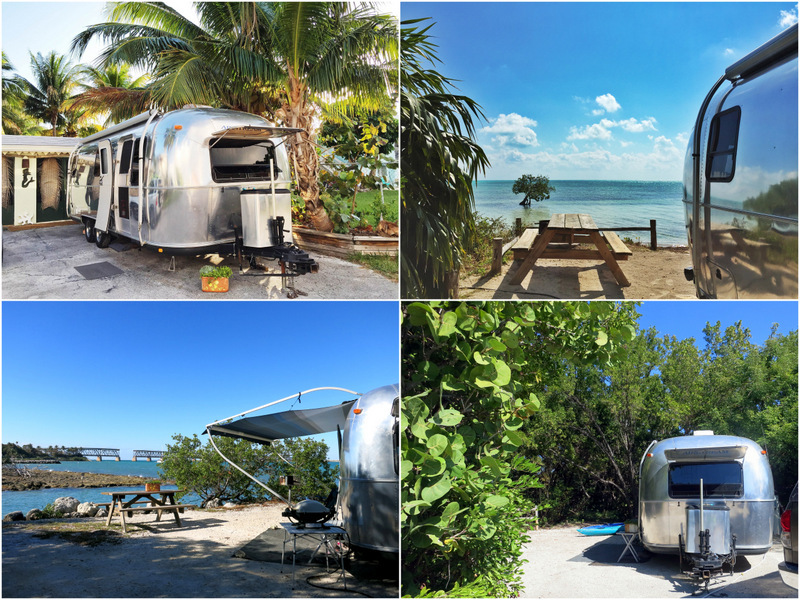 At $38.50 per night you get a spacious site, lots of nature, and at some parks like Long Key & Bahia Honda, an amazing water view. If the state parks are too rustic for you (or if you need full-hook ups) than the best way to get a deal on camping in the Keys is by paying the monthly rate. Most RV parks offer a significant discount off the daily rate if you pay for a month at a time. Just be sure to reserve early! Those spots fill up fast. There are several RV Parks in the Keys that are part of the Encore/Thousand Trails Network. We are personally not members, and have never stayed at a park that is part of the network (we tend to prefer public parks with more space & nature), but if you’re really looking to save money it would be worth looking into. This list is in order from the top to the bottom of the Keys. In general, the closer you get to Key West, the more expensive the RV parks. We expected food prices to be higher in the Keys. After all it is a chain of island where everything needs to be trucked in. There are also not a lot of grocery store choices (Winn Dixie or Publix )which always drives prices up. During our first visit to the grocery store in the Keys I noticed that most of the things we normally buy were a bit more expensive. Naturally I assumed that would lead to overall higher food costs. What I didn’t count on were the awesome deals on fresh produce at the weekly Big Pine Flea Market. Giant papayas for $2, mangos & avocados for $.50, a massive bag of oranges for $4, a box of 5 cucumbers for $3, zucchini for $.25 each….and on and on. We were also able to save a bit by signing up for a Winn Dixie card and taking advantage of the deals on some of the things we buy every week (large tubs of plain yogurt, english muffins, bottles of seltzer). Eating out is where you can really blow the budget in the Keys. There are lots of options and we worked hard to limit ourselves to no more than one meal out per week. This is a practice we try to follow all around the country. It can be difficult when you’re in a place with awesome restaurants and breweries (the latter of which seems to be missing from the Keys), but we’ve gotten good a picking one restaurant a week and sticking to it. Surprisingly, our per month food cost (grocery store & eating out combined) was a tiny bit lower than average. Not much, it only came out to about $35 less per month. But since we were sure it would be higher, we’re pretty pleased with that number. I know, I know, not everyone is interested in cooking. But the fact is that there’s no way to eat out often in the Florida Keys without spending a boat load of money. Remember, this entire area is built on tourism which leads to high restaurant prices. One of the things we really saved money on by eating at home was seafood. There are fresh seafood markets all over the keys where you can buy your very own fresh fish, lobster, clams, crabs, shrimp and so much more for a fraction of the cost than you would pay in a restaurant. The Keys are not far from Homestead, FL which is undeniably the produce capital of Florida. Every weekend the growers from Homestead bring down trucks of produce and sell them at the local Farmers Markets. The produce at these markets is far cheaper than what you will find at the grocery store, and probably much fresher as well. Unless you’re on an extremely lean budget, then you’re going to want to eat out while in the Keys. There are some really great restaurants serving fresh seafood, Caribbean cuisine, locally inspired dishes. Lunch is always cheaper then dinner, so if you can tear yourself away from the beach for an hour or two go get some lunch. 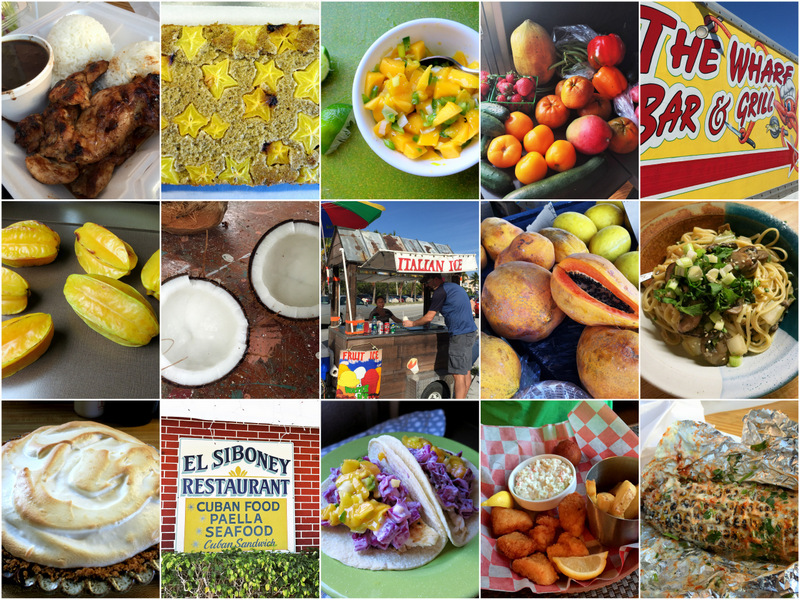 Some of the best places we’ve ever eaten have been the cheapest. We love nothing better then discovering a tiny restaurant with barely any seating, but a fantastic menu of fresh food with a local flair. We have a separate category in our budget for entertainment. It includes everything from renting a movie at a Redbox (also known as how to entertain yourself while overnighting at a Walmart) to museum entry fees, kayaks rentals, and anything else that we deem as a “fun” expense. During our time in the Keys we didn’t even come close to using all the money that we allocate each month for entertainment purposes. To be honest this came as a surprise. Probably because at the end of our stay we felt like we did so much. But the truth is that you don’t always have to spend money to have fun. When I think back on all the great thing we did in the Keys, I realize how many of them were either free or very inexpensive. We also saved ourselves a lot of money by skipping all of the museums, house tours, and other touristy stuff in Key West because we couldn’t bear to deal with the crowds. In the end the only thing we spent a significant amount of entertainment funds on was our amazing snorkeling adventure. We spent less than average on entertainment while in the Florida Keys. Almost 50% less in fact. 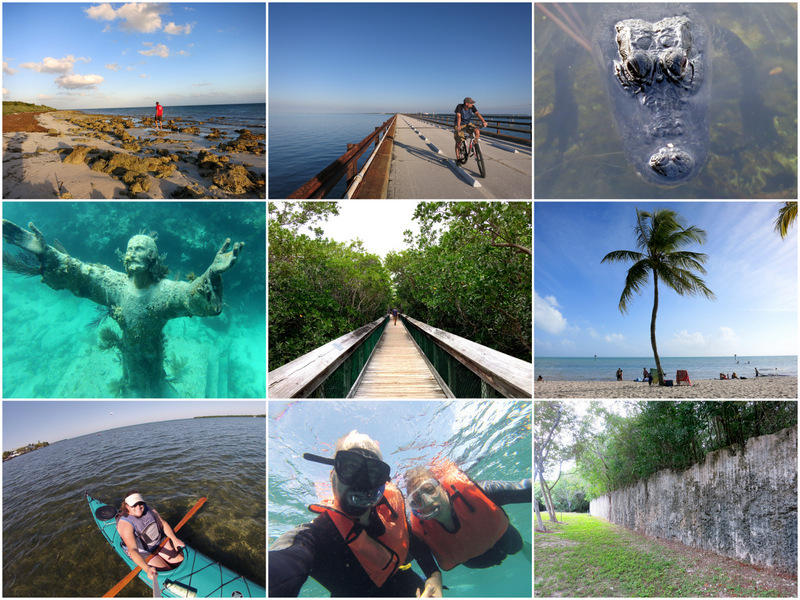 If you’ve never been to the Keys chances are you’ll want to do it all. But if you go on the glass bottom boat tour, the sunset cruise, the snorkeling outing, the guided kayak trip, the deep sea fishing excursion, visit all the museums, swim with the dolphins, and rent that jet ski…you’re gonna spend a LOT of money. For that reason you need to set some limits. Do the research ahead of time and pick one or two things that you really want to do and stick with it. It’s easy to find coupons and discounts on the more popular activities in the Keys. If you want to rent kayaks, bikes, or jet skis look around for the best deal. With so much competition most of these places offer great deals and specials to make you pick them over the guy down the street. Before you go to a museum check their website for coupons, or visit one of these websites. You don’t always have to spend money to have fun. There are plenty of ways to entertain yourself for free in the Keys. Go to one of the free public beaches, take a stroll on the Old 7 Mile bridge, ride your bike (if you don’t have a bike you can rent one in the Keys for around $10/day), walk down Duval Street, enjoy free entertainment at the sunset celebration at Mallory Square, tour the Wild Bird Center, go for a hike in the Key Deer Wildlife Refuge, or just sit outside and enjoy the warm weather! As you can see, RVing in an expensive area such as the Florida Keys doesn’t have to break the bank. My best advice is to set a budget, and stick to it. Whether you use the tried and true Envelope Method, or digital budgeting software such as Mint or You Need A Budget (also know as YNAB – the one we have used for many years and swear by) setting limits and and allocating funds for your different needs and wants makes it much easier to not go overboard while still enjoying your time in paradise. I meant to ask on your previous post, what is on that corn? It looks delicious! 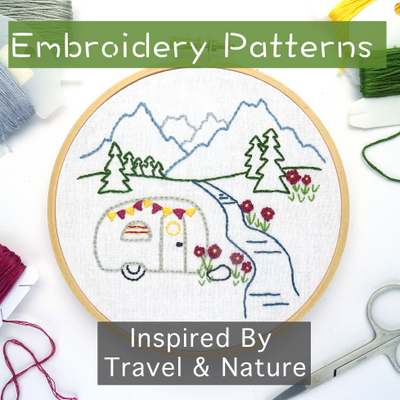 Thanks for another great post! You may have thought of this already, but I would LOVE to hear you guys compare wintering in Florida vs. the desert. I love the desert but you’ve now got FL on my radar! We still have a few more weeks in Florida, but when we leave I’ll definitely write a comparison post about FL vs. the southwest. Having the driveway as a fall back was the only way we could have gone down there without any initial reservations. We feel very lucky for that reason! Hope some of my tips come in handy during your stay next winter. Living in your RV in a driveway in the Keys is actually illegal. Plenty of people do it, but if you’re caught you will be fined. For that reason, you won’t find anyone advertising driveway parking :) We only got away with it because we stayed for short periods of time with campground stays in between. When we do get east, as in 2013, we consider the Keys a “vacation”. We had a glorious waterfront site at Grassy Key RV Resort for $575!! Big bucks for us, but then we’re normally boondockers, hanging out in the desert southwest. Yup, it’s a good place to go into with a vacation mentality. You know you’ll spend more money there, but you have to go at least once! When you say $575., how many nights is that? Judy, I think she meant for a week…but that was in 2013. Currently, the cheapest site there is $700/week. Great tips for making the Keys affordable, Amanda. And I love your photo collages. Thanks Laurel. I was pretty amazed after two months that we didn’t spend much more than normal. Your photo galleries add so much to this informative post Amanda. And I agree, this post should be included in travel magazines. The photos gallery of the food is my favorite. Made me realize how much good stuff we had to eat (and how much I like to take pics of my food). Great post and good tips. We spent a few days at the Jolly Rodger last month and enjoyed it. It was pricey by our standards, but we were just happy to have found a place in the Keys at the last minute. Great breakdown of the costs, Amanda. We love the Keys, and spent 3 months down there last year. We were able to stay for “free” by volunteering at the Bahia Honda State Park. We just confirmed going back down there this summer to do the same thing. So excited! To keep our travel costs down, we work it where one volunteers at the park while the other one works remotely online. During our travels, we like this best since you can spend 1-4 months somewhere to really get the feel of the area. What a great place to volunteer! How awesome that you get to do it again. I agree that the only way to get the true feel of a place is to spend a few months. Next winter we’ll be in the Keys for two months. Can’t wait to go back! In anyone’s experience what RV accommodations in the keys have the most space and (ha) privacy ? towing a 16 foot airstream. Thanks ! It’s been my experience that the only campgrounds in the keys with space & privacy are the state parks. Most of the private parks down here are fairly tight together. Are there any RV parks that you can rent the RV too in the Keys? Yes! I never looked into it extensively but I know that at least Sunshine Key RV Resort rents RVs and I’m sure there are others. Are there any places I could camp there with Pets? Specifically I have parrots & I’m looking for a place we could go where they would not be a problem? They have their own portable patio aviary under an awning & are draped at night (or brought indoors in bad weather) meaning they go to sleep at sundown and aren’t awake again until late morning when they are uncovered, I know camping with pets is problematic but any advice you could share would be Most welcome! Thanks in advance! I would suggest calling a few of the private parks and asking. Most parks allow dogs and cats and it sounds like your parrots are probably better behaved than many dogs so I bet you could find a place that would allow it. We spent 6 weeks in FL in Sept 2015, we were never able to get in any of the state parks. We stayed half way down the keys at Jolly in Marathon & loved it…..it is more costly if you get a space on the water so we opted to get one closer to the front of the park. Everything is very pricey so you have to pick & choose. I am not 100% sure what you are asking. There are a number of RV parks in the different Keys. I would recommend looking at the site Campendium.com and doing a search for RV parks in the Florida Keys to see all the options.